Greener than the grass that grew beside her cabin door. Katy did; Katy did it, Katy did. Dropping in with keen perception of a coming feast. Just at times when callers' presence chained us to our chairs. And a charred and smoking ruin was our best beefsteak. 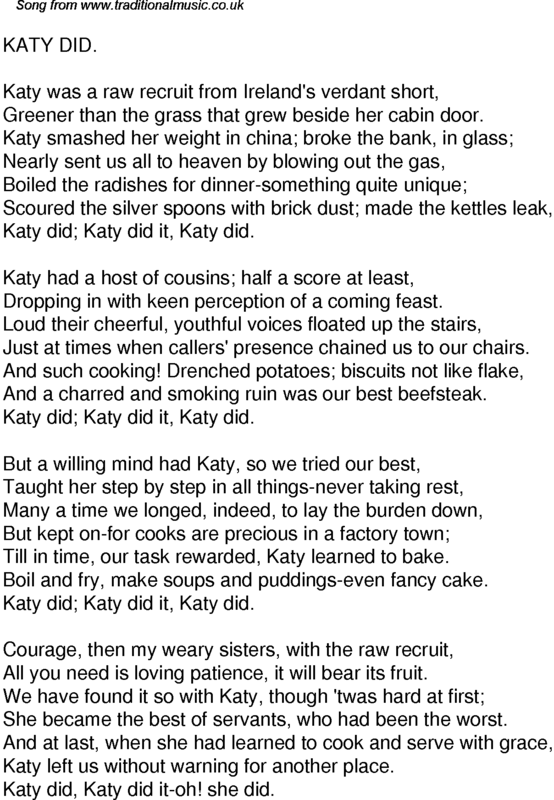 Till in time, our task rewarded, Katy learned to bake. Boil and fry, make soups and puddings-even fancy cake. All you need is loving patience, it will bear its fruit. She became the best of servants, who had been the worst. Katy left us without warning for another place. Katy did, Katy did it-oh! she did.